General. Geiranger is a small place that is located at an idyllic spot at the end of the Geirangerfjord and is encircled by the stepp walls of the surrounding mountains. Despite being a very small settlement, it is one of the most popular tourist destinations in Norway. The reason for this popularity is due to the beauty of the fjord. During the summer months, the village, counting merely a few hundred inhabitants, is flooded with tourists. There are several hotels, campings and restaurants and alongside the quay there are various souvenir shops. Most cruises in Norway have a fixed anchorage in Geiranger; it is rather exceptional to see no cruise ships in the fjord especially during high season. Despite being giant vessels, the enormous ships seem tiny compared to the majestic surroundings of the fjord. Although the place attrackts a lot of tourists, it remains a must-do for a visit to Norway. History in short. The village emerged as an agricultural settlement at the end of the fjord where the slopes are not that steep. Since the "discovery" of the fjord's beauty by the first travellers in the 19th century, gradually the main source of income shifted from agriculture to tourism. Geirangerfjord. The real attraction in Geiranger is the fjord, by many described as the most beautiful one in the world. This of course is a very subjective statement but honestly, there is little chance that the natural beauty of the place will leave you untouched. It is not without reason that pictures of the fjord easily find their way to calendars and postcards and you will not find folders promoting Norway in which this place is not praised to the skies. The fjord meanders through an impressive landscape with snow-covered mountain tops and steep walls. When exploring you will see dozens of waterfalls on both sides of the inlet. It's particularly spectacular when there is a lot of melting water. Strangely enough there are also a few farms that have been built on the steep walls. Some of them are located close to the water but others have been built on virtually unreachable spots high on the ridges. All these farms have been abandoned in the meantime but they are being maintained by a special heritage foundation. The fjord is not very long; about 15 km only but the ferry from Hellesylt (you can take this one as an alternative for an expensive fjordcruise) takes about an hour to clear the distance. 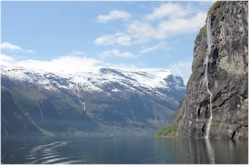 The Geirangerfjord has been listed by Unesco as natural world heritage site. Seven sisters. 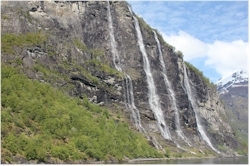 The so-called "Seven Sisters" (The Syv Søstrene) are the most well-known waterfalls in the Geirangerfjord. Depending on the amount of melting water you can count seven or less waterfals; the highest one reaches about 250 meters! Obviously in this country of sagas and legends, a story is linked to these falls. According to this story, the seven sisters went out dancing but they returned home later than the agreed hour. As punishment they were condemned to stay single and to stay at the place they were for the rest of their life. As you can see, they are still there. On the other side of the fjord, there is another waterfall called the "wooer" (Friaren). In vain, for centuries he has been trying to seduce the seven sisters. You don't need to book a special tour to see the waterfalls; you pass them by anyway with whichever fjordcruise you take from Geiranger. Monuments. 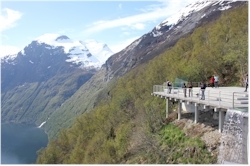 Without wanting to show disrespect for the monuments in and around Geiranger, they are not the reason why thousands of tourists come to Geiranger. Nevertheless, if you like a portion of culture in this extraordinary natural environment, you can visit the small church of Geiranger. It's a modest white building from the middle of the 19th century built on an octagonal ground plan. 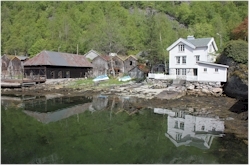 Next to the church, there are also some old, in the meantime abandoned, fjordfarms and a few old wooden houses. Most of these houses near the harbor have been taken over by touristic exploitations such as souvenir shops. Other places of interest and activities. There are several superb look-outs close to the village that are worthwhile for the impressive view you have on the fascinating surroundings: Dalsnibba (top of the mountain), Flydaljuvet and Ørnesvingen. The Eagle's Road is the main access road to the village and swirls through several hairpin turns up the steep mountain wall to the mountain pass (look-out Ørnesvingen is reached via this road). Most activities are happening in the fjord itself such as kayaking or fjordcruises. Alternatively you can also take the more budget-friendly ferry to Hellesylt. If you prefer doing something on land, you can choose between various hiking trails, you can rent a bike or an electric vehicle to explore the area. If you like a more traditional activity, then you can take a peek at the hotel Union where they have a small collection of oldtimers that were used in the years 1920 - 30 to drive around the tourists in those days. And don't forget the big troll at the port; it's extremely kitsch but very popular for a picture. How to reach Geiranger? 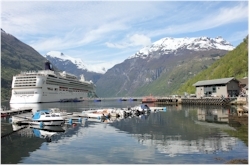 The arrival in or departure from Geiranger is equally impressive whether it's by water or by road. From Hellesylt or Valldal you can take a ferry boat. There are bus services with the surrounding settlements. If you have your own transport, take into account that not all roads are always open during the winter months. So, please check this properly before you leave to avoid unpleasant surprises. Picture 3: the "Seven Sisters"